We supply fully integrated systems for multibeam swath bathymetry survey. All system components are carefully selected to yield a balanced, proven combination that meets your survey requirements as well as your budget. Systems are available for permanent installation as well as in portable configurations. 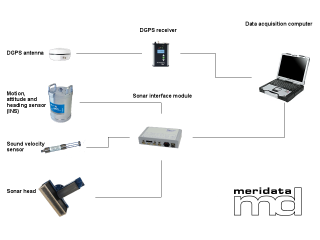 Besides all requisite instruments, sensors and the data acquisition system, we are in a position to deliver every single item you will ever need to operate the system - with proven compatibility. A bathymetric system can be complemented with any hydroacoustic system (e.g. sub-bottom profiler or side-scan sonar) to yield a fuller picture of the seabed and sub-seabed.